Right after we got down from the plane, a heavy rain sneaking from the mountains of Aklan got my attention. I ran immediately towards the airport’s arrival area to secure myself from getting wet. Airline staffs were busy distributing umbrellas to all passengers when the rain poured. 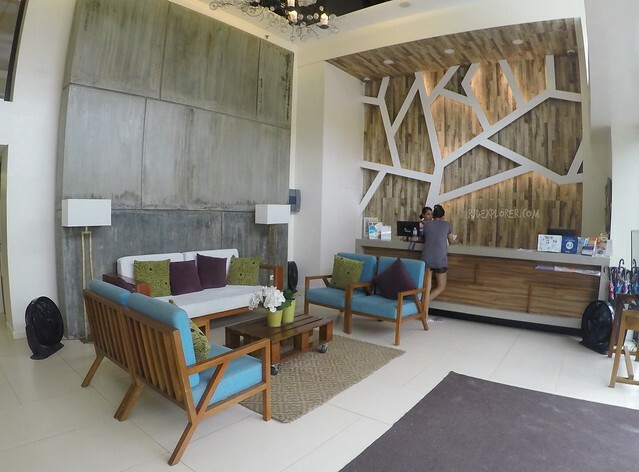 But I blazed immediately to the arrival hall to secure myself and fill in my tourist arrival form putting Ferra Hotel Boracay on the accommodation row. High ceiling lobby of Ferra Hotel. Tourism officers in Caticlan airport required every guest to complete the form needed on their Boracay visit. Details such as name, number of companions, city originated, and hotel accommodation. All tourists were advised that Tabon Port is being utilized for the boat transfers to Boracay Island due to strong waves in the Jetty Port side. We secured the required payments: terminal fee, environmental fee, and boat fare, and hopped on our assigned boat going to Tambisaan Port, an alternate to Cagban Port. The e-jeep served as our transfer from the port to D-Mall. From there, we walked to Ferra Hotel, our home for a night on the island. Suspended chairs on both ends of the entrance got our attention before finally entering the high ceiling lobby of Ferra Hotel. We noticed a wall art that resembles a tree and was welcomed by the ever-smiling hotel staff at the front desk. Since our arrival was too early for check-in, we were advised to wait at the restaurant and enjoy our welcome drinks while they prepare our loft room. 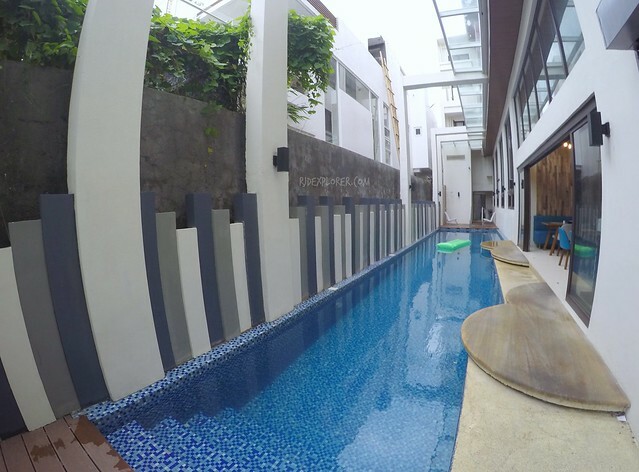 By the way, the elongated dipping pool is situated adjacent to the restaurant. Ruf Restaraunt, in-house restaurant of Ferra Hotel. Elongated dipping pool near the restaurant. Gloomy weather covered the entirety of the island on our first day. 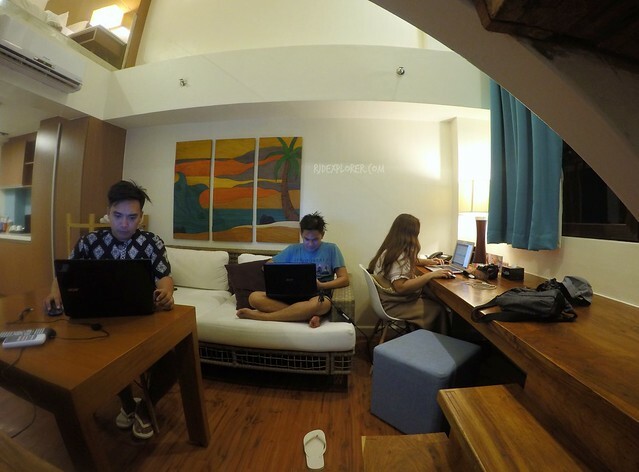 We were forced to stay inside our cozy abode and just enjoy Boracay away from the beach scene. We had no issues on that as we brought our laptops with us to continue working with our blogs. The floor-to-ceiling glass window, overlooking the swimming pool, automatically served as a way for us to monitor the weather. 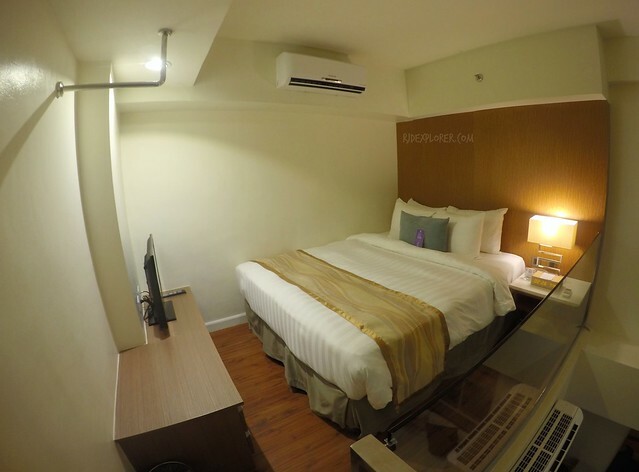 Ferra Hotel’s One Bed Loft, apart from having a queen-sized bed and a sofa sleeper, has two cable-enabled televisions, and two air-conditioning units both for the lower level and loft. 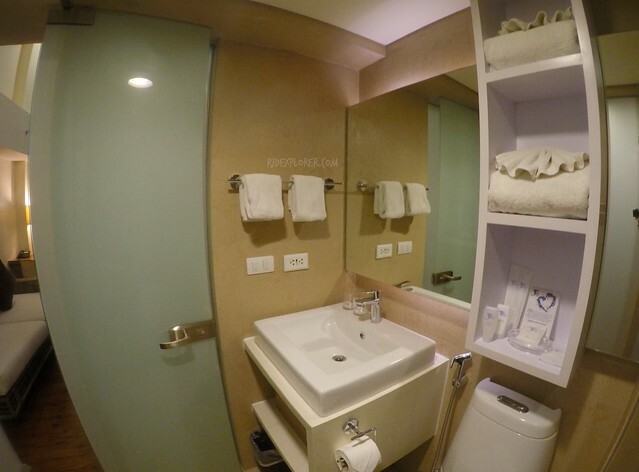 Staying inside the room will make you appreciate the coffee and tea making facility, refrigerator, and microwave. 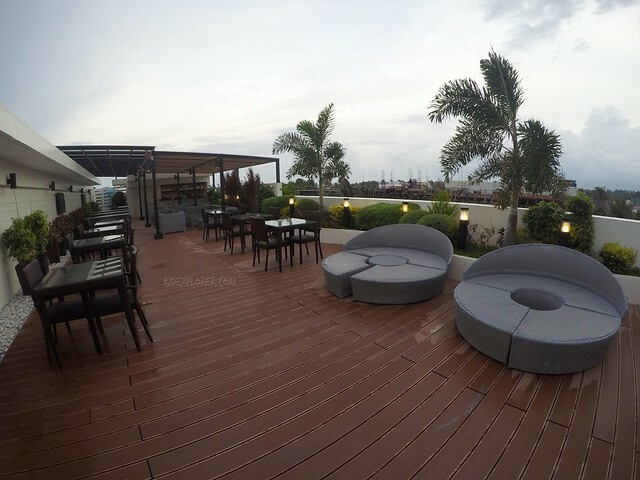 Part of the accommodation is the complimentary cocktails usually served on the hotel’s deck during sundown. Due to intermittent weather during our visit and also to ensure guest’s safety, management decided to have it at the restaurant. 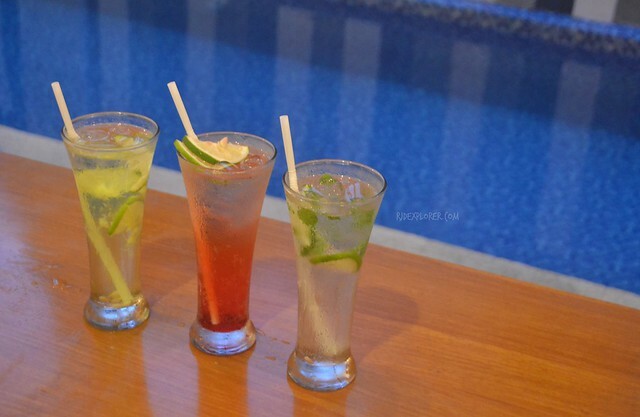 We had Fidel Castro, Shirley Temple, and Virgin Mojito for cocktails. Complimentary cocktails at Ruf Restaurant. Since we already got out of the room, we decided to have dinner at Ruf Restaurant, the hotel’s lone in-house restaurant. Perfect for our drinks, we ordered Fisherman’s Catch Fish and Chips (Php350) with crispy fish fillet thick cut fries, The Best Wings of My Life (Php550) having three kinds of wings: Vietnamese, Buffalo, and Coca Cola, Grilled Back Ribs (Php395), and Sate Sampler (Php385) which is grilled chicken, pork, mixed seafood in peanut sauce served with garlic annatto rice. We ended the meal with their Mango Mystique Crepe (Php250). 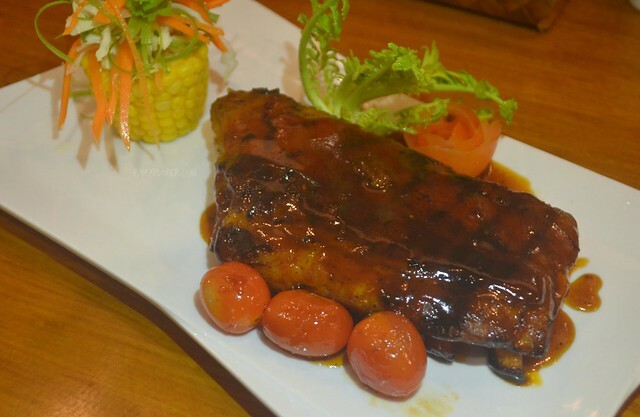 The restaurant also serves the buffet breakfast included with the room reservation. 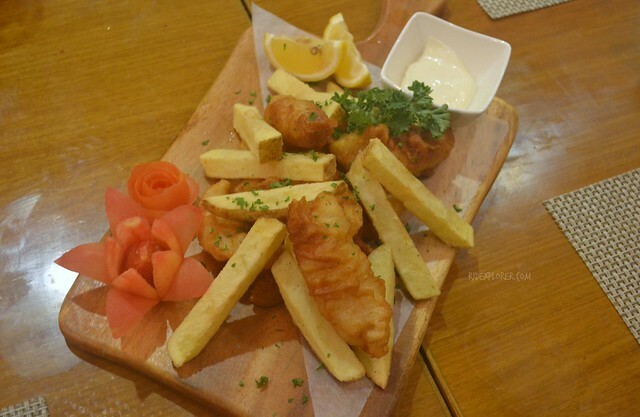 Fisherman’s Catch Fish and Chips (Php350). 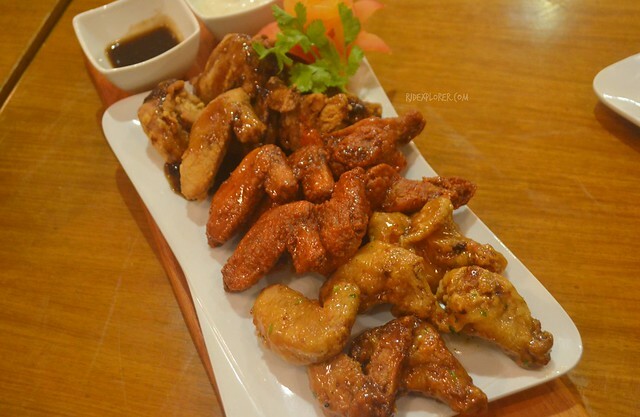 The Best Wings of My Life (Php550). We need to battle our sleepiness and decided to grab a coffee at Starbucks, which is located in White Beach. Getting some umbrellas offered by the crew, three tourists loitered on the flooded streets of Boracay just to avail a cup of coffee from an overrated brand. The wind was really howling in White Beach as we fix our coffee cravings. Ferra Hotel is located in the middle of the island. It’s not beachfront but the hotel is very accessible on either side of the island, White Beach or Bolabog Beach. In fact, after the heavy breakfast, we strolled down the road and visited Bolabog to observe morning happenings on that side of Boracay. During summer, the area is filled with kite-surfers doing tricks and skimming on the water with the help of the inflated kite tied to their body. Living room with the sofa sleeper on Ferra Hotel’s One Bed Loft. 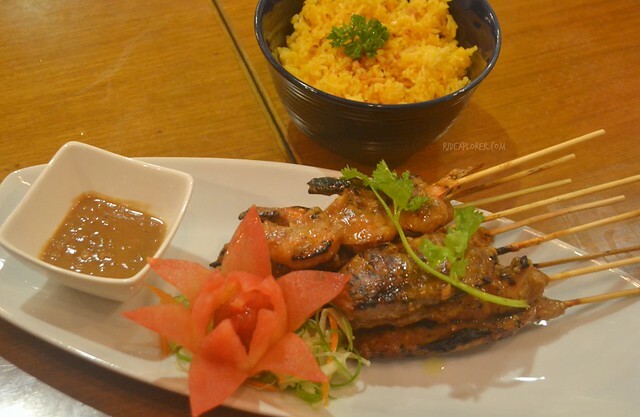 Numerous restaurants, backpacker hostels, and lodges are located in Bolabog making this side of Boracay funkier in terms of varied happenings. White Beach has its spectacular sunsets but Bolabog also offers its meek and serene sunrises. After hours of walking from Bolabog to White Beach, and to Diniwid, I wasn’t able to resist the comfy and inviting bed in our loft. In a matter of minutes, I squeezed myself on the soft duvet, cuddled with the pillows, and went to dreamland. It was almost checked out time when the guys notified me to get a shower and prepare. It was really a short stay at Ferra Hotel that we weren’t able to swim in the pool. We regret that the weather didn’t allow us to enjoy some of its facilities but we were also thankful for the weather because we enjoyed our room. 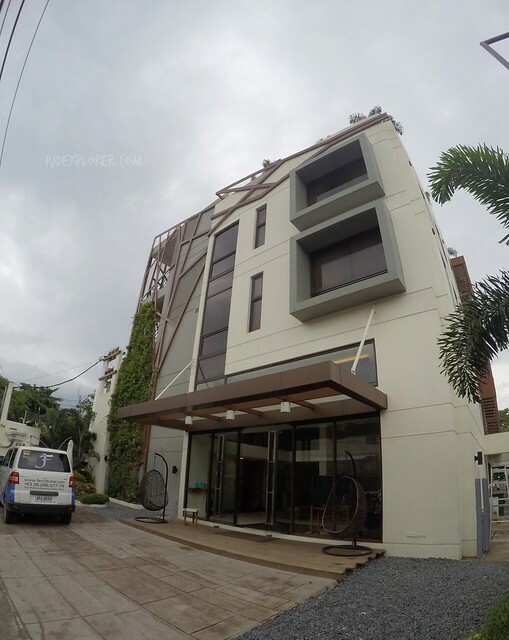 Boracay Island has a lot of hotels to stay but if you’re after a location that is just 5 minutes away from D Mall and Bolabog Beach, then Ferra Hotel perfectly fits for you. 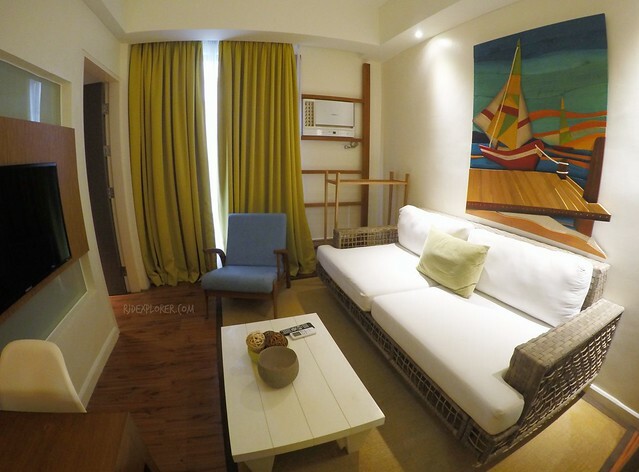 Disclosure: Ferra Hotel hosted our first night during my third visit to Boracay last July 2016.